We’re all taught basic fire safety at school but those days are a distant memory… How should you escape from a first-floor room? What do you do if a saucepan catches fire? What’s the best way to extinguish candles? Our quick guide contains all the essentials for home fire safety. If you don’t know anyone who has had a home fire, you’re very fortunate – there are more than 180 fires every day in the UK. Take fire prevention seriously and you should be one of the luckier ones. There are many tips given for fire safety, some well known – we all know the risks of deep fat fryers – but some less so. Do you, for example, close the bedroom door at night? Here are some basic guidelines to bear in mind. Smoke Alarms. Fire drills aren’t just for school and work. 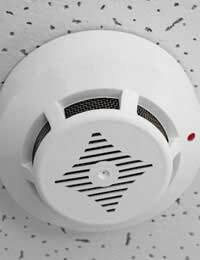 Put your alarm somewhere that wouldn’t usually get smoky (the kitchen ceiling is a bad place unless you want a drill every dinner-time!). In a bigger house, fit an alarm for each floor – or even each room, if you won’t hear from upstairs. Test your alarm weekly – at the least, replace its batteries once every 12 months. Cook Safely. The kitchen is your home’s biggest fire hazard: scalding temperatures and forgotten pans make a recipe for disaster. Take special care in this room. Don’t leave children or saucepans unattended. If you deep-fry food, then buy a deep-fat fryer that allows you to put the lid down and turn the temperature up or down without opening it. Whatever you’re cooking, use a timer to make sure you don’t walk away and forget it. And keep a clean kitchen, because greasy residue catches fire very easily. Candle Safety. Unwatched candles are a real hazard. It’s too easy to forget about them and go out or to bed. Put candles on heat-resistant mats in places where you’ll see them before leaving the room, and snuff them out properly before you lock up at night. Candles can also emit unpleasant fumes when they reach the end of their wax. To avoid this, put them out when only 5mm of wax remains. Be Vigilant. Common causes of fire are: overloaded sockets, unattended matches or lighters, cigarettes that weren’t properly stubbed-out, and appliances left on standby. Keep an eye out for these hazards. Sleep Safe. Once your alarm is installed it will protect you at night. When you go to bed, shut your bedroom door – smoky fumes can do serious damage before you even wake up. If you have a family, shut all the doors that you can, in hope of containing any fire that breaks out. What if the worst happens? Get out, stay out, and dial 999. Refresh your fire-safety knowledge – read this first. Make sure everyone in the house knows the escape routes, and where to find door or window keys. When you’re cleaning, check that keys for doors and windows are still in the right places, so that people can find them quickly. At the same time, check that doors and windows are kept free from obstruction. Talk to your family about emergency procedures – how will they get out safely? Where will you convene in case of a fire? Remind your children not to try to retrieve valuables – just get out. If you need to escape through a smoky room, crawl – the air will be fresher closer to the ground – and keep a jumper over your mouth. When you reach a door, touch it cautiously to check it’s not hot. If it’s too hot and you can’t risk opening it, stay where you are and block the edges of the door to contain the fire. If you have to escape from a first-floor bedroom, throw out some bedding to break your fall. If you are too high to escape, close the door tightly on the fire, open a window and wait near it for the fire service. If a saucepan catches fire, switch off the heat beneath it, get everyone out of the house, and call 999. Consider buying a fire blanket and a fire extinguisher – specially designed to put out fires. These are useful for minor incidents and must not be used before evacuating. If someone’s clothes catch fire, use a thick piece of fabric – such as a coat or specially designed fire blanket – to smother the flames. Cutting off the fire’s oxygen supply will prevent it from burning. If your own clothes catch fire and nobody can help, roll on the ground to put out the fire.